The Long Beach Unified School District’s first school built from the ground up with Measure K funds opened this week in Signal Hill. Jessie Elwin Nelson Academy, named after the co-founder and first mayor of Signal Hill, is built to accommodate 850 students in grades six through eight. The new school is one of many projects that are part of LBUSD’s Measure K school construction and renovation efforts. Technology at Nelson includes an iPad for each student to use at school and at home. Nelson is LBUSD’s first school to broadly integrate wireless iPad technology based on instructional strategies called for in the state’s Common Core standards. “We are going to pilot new ways of teaching and learning,” said Principal Sparkle Peterson, who, along with about 60 staff members at Butler Middle School, transferred to Nelson (Butler will now accommodate Roosevelt Elementary School students while their school is rebuilt). Measure K funds, approved by local voters in 2008, are protected from state budget cuts and must be used solely for construction and renovation. 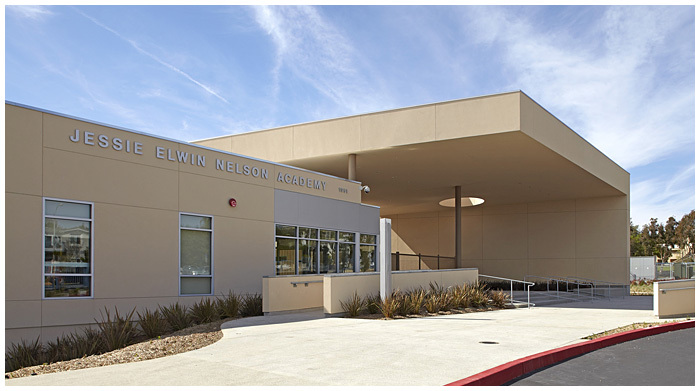 The $45 million Nelson campus at 1951 Cherry Ave. is equipped with flat-screen TVs, high efficiency lighting and water systems, a soccer field and gym. NEW SCHOOL — Nelson Academy, named after the co-founder and first mayor of Signal Hill, opened this week. The middle school at 1951 Cherry Ave. is built to accommodate 850 students. Each student will receive an iPad to use at school and at home.